Rake (Caster Angle): 27.1 deg. Innovative Engine Design: A liquid-cooled, DOHC 4-valve, fuel-injected engine with forward-positioned downdraft intake delivers class leading engine power. This design allows for unmatched mass centralization, concentrating the motorcycle's key components—engine, fuel tank and exhaust system—toward the center of the motorcycle achieving light and nimble handling performance. 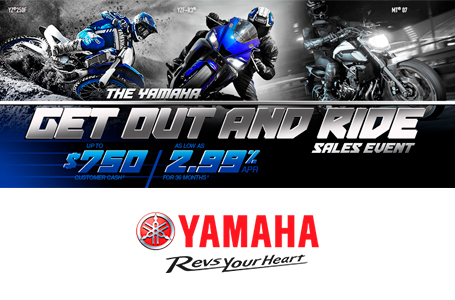 Bilateral Beam Aluminum Frame: A Yamaha's renowned bilateral beam aluminum frame features compact overall dimensions that balance minimal weight with the strength and rigidity needed for race-winning performance. This frame features a forged section at the swingarm pivot and engine mounting brackets for tuned responsiveness, handling and unmatched lightweight feeling. Piston, Rod and Crankshaft Balance: A flat-top forged piston features a bridge-box design for additional strength with minimal weight. The piston, rings and DLC-coated piston pin, along with the offset cylinder configuration, all reduce friction loss and contribute to quick response. The engine's intake ports, cam profiles, high-strength connecting rod and optimized crank and counterbalancer all work together to produce potent high-rpm power with user-friendly delivery and exceptional reliability. Race Winning Details: The YZ450F includes top-spec details, including 1-1/8" aluminum tapered handlebars, wide 55mm footpegs, a quick-adjust clutch perch, stylish black rims and gold chain. 270mm Front Brake: A large 270mm front brake disc is the same system fitted to the YZ450F™, and uses an aggressive pad material for exceptional stopping power and braking control. Out back, a durable heat-resistant rear rotor boosts brake durability.